How to play 2048 game one of the most addictive puzzle games to reach higher scores on this top entertaining puzzle game on markets of Apple, Windows and Galaxy. 2048 game is a brain teasing puzzle game. I love playing this wonderful game. Puzzle game 2048 is so loved by players of all ages so that you can download 2048 game app from any smartphone marketplace for free and start playing yourself or encourage your children to play this puzzle game. The aim of the 2048 game player is to reach high scores by joining tiles with same numbers on them to end up with higher numbers. For example, in 2048 game players can join tiles with 2 and 2 on them which makes a tile with 4 on it. Or as a second example, you can join tile with 16 on it with an other similar tile carrying 16 for a resulting tile of 32. If the player of this addictive puzzle game can reach 2048 marked tile, he or she wins in the 2048 game. So players must merge two tiles with 1024 on them to beat 2048 game and win. I am sure about that because of my playing 2048 game experience for the last month, no player who can reach 2048 will not stop playing 2048. The game continues event after 2048 tile is formed. You can test your puzzle solving brain in this marvellous game by going as far as you can. The basic rules of the game 2048 is very simple. 1) 2048 puzzle game is played on a board of 4x4 square game board. Although there are now many variations of the 2048 game board like 5x5, 6x6, etc the original 2048 game is shipped with a 4x4 16 squares board. 2) When the played swipes the tiles, if possible all tiles on the game board move as many squares ahead on the same direction of your move. 3) If two tiles with the same numbers collide, they join or merge into a single tile. And the number on the new tile is the sum or double of each colliding tile. 4) After the 2048 game player makes a move and swipe the tiles on the game board, a new tile with number 2 or 4 is placed by the computer on the game board. 5) The coordination of the new tiles which are added on the board after the player makes a move is randomly determined. If the boundaries of the board are empty, they are fist placed on a square which is on the edge of the board. The player continues playing 2048 puzzle as long as there are enough places on the board for a new tile. If all tiles are occupied by tiles which do not join with its neighours (on two direction left-to-right or top-to-bottom) the game ends for the player. All tiles on the board are either 2 or the power of 2 like numbers 2,4,8,16,32,64,128,256,512,1024 and 2048. Of course the puzzle solver can continue after 2048 tile is created by merging two 1024 tiles. If it possible to form tiles with numbers 4096, 8192 and 16384 too. I'm not sure but the maximum number that can be created on a 4 times 4 game board is 32768. If you think 8192 is a good score to target, as seen in above screenshot from 2048 game which is my best score yet covered, you can read my strategy and tips on 2048 puzzle game. Please read my tips for 2048 game tutorial which I hope will help 2048 players to reach higher scores. There is also a web variation of the 2048 game. Players can play 2048 online on the web using a web browser as well. You can use the arrow keys on your computer's keyboard instead of using gestures of your finger taps. 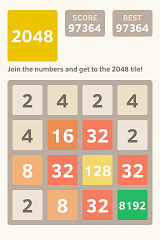 In fact swiping on the screen of a smartphone or a tablet PC makes a wonderful gaming experience for 2048 game play. Struggling with the keyboard will possible bore the player after half an hour of game with thousands as the score. On the other hand, while playing 2048 addictive game on your smart device, you will not realize how much time you have been playing. Please visit ov3y.github.io to play this addictive puzzle game, the web version of 2048 game on the web.